There's always a breath of anticipation when a band returns from a long lay off, with a new release. That anticipation is magnified if such band is a leading light in their scene or country. 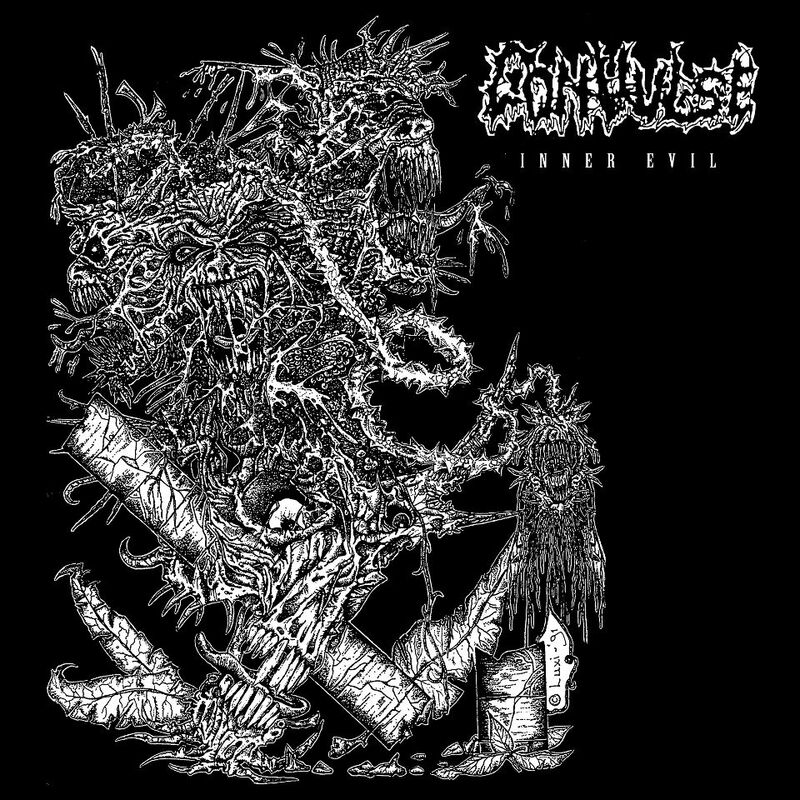 Convulse have just released their first record since 1994, the two track EP Inner Evil. Convulse released their first demo back in 1990 and went onto release another two demos, two full lengths and a single up until 1994. Inner Evil will be released on the 25th of January by the fast rising Finnish label Svart Records, on vinyl and is also coming out on tape. Inner Evil is full of sinister lead work and has an all encompassing sound. Convulse have elected to make sure this EP has a modern production, but one which stays true to the roots of their sound. The vocals are low in pitch and the guitars seem to take centre stage.The drums are pounding and very effective when Convulse switch from their razor sharp death metal to a slower passage. They bring thrash metal elements into the title track with a screaming solo, which sounds awesome! The slow passages here really impress me, as do the riffs which follow a similar melody throughout which keeps continuation high. Convulse make these songs last that little bit longer, to make sure they are firmly planted in your head and while they are a death metal band, the songs actually do worm their way in. God Is Delusion starts with a calm plucked guitar intro, which is really well played. It starts to pick up pace with some twin guitar melodies before Convulse launch back into their flailing death. Their thrash elements return here to and there's plenty of opportunity for the instruments to take the slack. The vocals sit in the mix, so they don't overpower the music. God Is Delusion is not as tuneful as Inner Evil, embodying some of what makes Finnish funeral doom so good. They harbour a huge amount of grandeur on this short EP, but grandeur that isn't over the top. The musicianship is very strong, the song structures a well thought out and the sound is very good. A great return to battle for Convulse and a nod to what's to come from their new album! Hi Rami, thank you for taking the time to answer my questions. You’ve just released your new EP Inner Evil, which is your first release in 19 years. How does it feel to have the EP out and what have people’s reactions been like towards it? Greetings from the grave should I say. I am pretty sure you will like the new "Inner Evil" EP. Its fresh and tight, but having echoes from the ancient times of "World without god". The first response and reviews have been also very good. So I am not concerned at all. What was the writing and recording process like for Inner Evil? Can you give us an insight into how it all came together? We wrote those two 6 minutes long tracks in the end of the summer 2012 and have enough time to rehearse them and do comeback shows together. New tracks sounded so good that I decided to go analog studio and record everything like back in old days. We recorded it pretty much live. Some guitars and growls afterwards. I am very pleased with the natural sound of it and working in reel-to-reel recording studio. No computers, no monitors, no triggers. Just the band, pure energy and the songs. Keep it simple! I love to work with this new Convulse, because together we have over 100 years experience of playing metal music. It makes everything faster and easier. Svart Records have handled the release of Inner Evil. How did you decide to work with Svart Records? I have been watching Svart Records releases for a couple of years. I admire their ambition to vinyl format and the high quality of re-releases. I took contact when we had done first new song. Svart Records were very interested in our new material and offered very reasonable record deal. It is also easy to co-operate with Svart, because they are also Finnish. So here we are. First EP comes out 25.1 and the album recordings will start at the end of summer 2013. Inner Evil has been pressed on different formats, including vinyl and cassette. Is it important to you that your music is released on the right formats? You hit the nail. I prefer vinyl and tape. I am not listening digital music at all. I walk with my Sony Walkman and listen to tapes and at car I listen to tapes. At home I prefer vinyl or cassette. I love to play vinyls and the feeling keeping vinyls in my hands. And look at the cover art of the vinyls! Svart Records weren’t interested in releasing "Inner Evil" in tape. But they had nothing against that we release the tape version by ourselves. Stepping away from Inner Evil for a second, when Daniel Ekeroth’s book “Swedish Death Metal” was published; it put a lot of cult, early Swedish death metal bands back into people’s consciousness. Do you think it also helped to build interest into death metal bands from neighbouring countries, like Finland? Perhaps it is so. I think the younger metal fans all over the world just want to discover the roots of the brutal death metal and experience how it sounded back in old days. It is pretty same thing when I listen to rock/heavy bands whose glory days were back in 70´s. Convulse are considered as one of the leaders of the Finnish death metal scene by many, but which Finnish death metal bands do you look up to or take inspiration from? I think we are much more honoured in other countries than in Finland. Maybe nobody is a prophet in his own land. I like a lot of Abhorrence, Demigod, Disgrace, Xysma and so on. Vorum is a good example for a new death metal band playing old school style. Why do you think Finland keeps on producing such extreme metal bands? You should come here at winter time and you could understand the melancholy feeling of the dark and cold. Here is also huge fan base for metal bands. At least older guys like me listen to mostly metal music. It is because of the heavy metal invasion to Finland in the middle of 80´s. When you have a lot of metal music fans, you will have also a lot of musicians and bands. You are planning new releases in 2013. Are you able to tell us anything about what you have planned? The "Inner Evil" EP comes out at 25.1 and we have planned to go to the studio at august to record a full-length album. New album should be ready for release in November 2013. We have four new tracks ready now and every week we are making new music in our rehearsal place. You are lined up to play Maryland Death Fest in 2013. Beyond that, do you have any more plans to play live and tour this year? We will have some minor gigs in Finland, one sure gig in Europe and maybe a tour in Europe in the end of 2013. Nothing sure yet, but hopefully everything goes fine and we have chance to play in Europe soon. What do you think of the current death metal scene in Finland? Are there any bands in particular that have caught your eye? Here are some good death and thrash bands like Vader and Final Assault. I am not an expert of the scene in Finland nowadays, sorry about that. Thanks for this interesting interview. Stay in touch and order "Inner Evil" from Svart Records or the tape version straight from me. You can follow Convulse in Facebook. You can also pick up a tape copy on pre-order directly from Convulse. Just head over to their Facebook page at http://www.facebook.com/Convulse for instructions on how to order it.